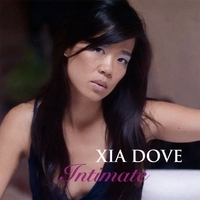 "Intimate" by Xia Dove is a interesting blend of Eastern sounds, jazz, R&B and electronic music. At center stage is Xia's impressive vocals, which have qualities similar to Alicia Keys. The arrangements behind Xia's pitch-perfect vocals are well-layered and nicely complement her voice. The songwriting provides memorable songs that nicely highly this talented singer. Highlights include the title track "Intimate," a gorgeous and heartfelt song that certainly needs nothing more than the Piano and Xia's voice. "Love Is on My Mind" features a nice rolling piano line, reveals a lightness and has a huge chorus with wicked drum fills. "Watching Over Me" shows off Xia's vocal flexibility, with some soulful vocals, and a nice arrangement in the horn section. If you enjoy outstanding female pop vocalists, you'll like this CD.